Aerosmith's Steven Tyler will go out solo on the road for most of the summer. This isn't his first tour, as some have alleged. He's done over 100 live shows throughout his career, including 42 in 2016 alone, but it is his first true tour since the release of his debut solo album, the country effort We're All Somebody From Somewhere. Fifteen shows are on the schedule starting June 12 in Lewiston (Buffalo), NY and running through August 7 in London with plenty of room for additional dates. He will, once again, be backed by the Loving Mary Band while the Sisterhood Band, which includes Rod Stewart's daughter Ruby, will open. Tyler told USA Today that the show will be a mix of songs from his country album and Aerosmith classics, including talking about how the songs were created. "I figured I'd talk about Sweet Emotion and Dream On and where I was when I wrote it, and Seasons of Wither and how I played it." 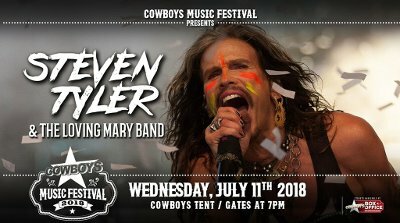 As of today, Aerosmith only has one date in 2018, Saturday, May 5 at the New Orleans Jazz & Heritage Festival.